The Inductance is the property of a material by virtue of which it opposes any change of magnitude and direction of electric current passing through the conductor. In other words, the inductance is the property of the coil in which the emf is induced in the coil because of the variation of flux. The inductance is added in the circuit through the inductor. The inductor is basically the coil of wires which concentrates the magnetic field into the circuit. Inductance is denoted by (L), and its unit is Henry. Inductance is said to be one Henry, when a current of one ampere passes through a coil of conductor changes and the voltage induces at the rate of one volt across the coil. Where I is the current flowing through the inductor in ampere. The voltage across the inductor will be zero if the current flowing through it remains constant. 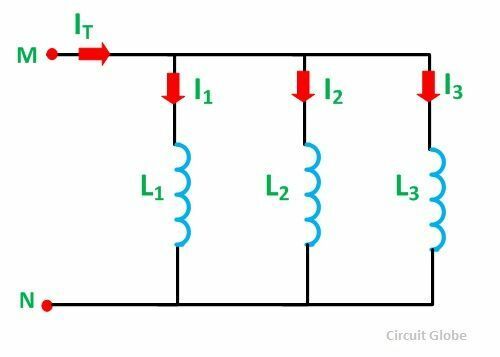 This means that when direct, steady current flows through the inductor, it behaves as a short-circuited coil in a steady state condition. If there is any small change in direction or strength of the current, the inductance will appear. If we put the value of dt as zero (dt=0) in equation (1) it is seen that for a minute change in current within zero time, gives an infinite voltage across the inductor which is not a feasible condition and thus in an inductor the current cannot be changed abruptly. Thus after switching the DC voltage, the inductors act as an open circuited coil. The inductor stores a finite amount of energy even though the voltage across it may be negligible. The inductors are classified depending upon various factors like the size, core material used, type of windings, etc. The core plays an important role in the selection of the inductor. The current across inductor L1, L2, L3 will be I1, I2, I3 respectively. The value of current across each inductor will be same. In sensors, transformers, motors and various filters. The main application of the inductors is to store energy in the form of the mangetic field.